Hearing Hash? Enable CTCSS to squelch out the digital signal. The Hibbing Amateur radio Club sponsored the initial install of the 147.120 MHz machine. LEROY K HOIKKALA, NØEUR, was the original trustee. Dave Huston , WD8RFS , took over in 2001. James Townley, WØHRF, was granted ownership as a RACES affiliate in August of 2009, a year after Dave’s death. Ownership was transferred to NØAGX on April 15, 2016. I am looking for a local amateur who has a base station available to host the WIRES-X node. A suitable internet connection, Windows 7 or newer computer, and a digital radio is required. The HRI200 would be provided enabling the system to host a room. If interested, contact me by leaving a REPLY below. The WIRES-X node is back up after resolving the choppy audio signal. Turned out to be a matter of signal strength. An increase in elevation on the antenna coupled with increased power fixed the problem. An issue with choppy audio when in a digital room has been reported while running WIRES-X over the last several weeks. The node has been taken down until the cause can be determined and a fix is implemented. Analog audio has also experienced inter-mod like interference. The two could be related and will require some investigation. The repeater will remain operational, but will not be running WIRES-X until further notice. WIRES-X is back! – running the Portable Data Network (PDN) function just released for the FT2DR. Operating in the access mode from the N0AGX base station at 750mW, the repeater will now support users running WIRES-X. from their System Fusion compatible radios in digital mode. PDN does not support hosting a room or running in analog, hence there are some operating techniques [click on this link] to be aware of. Digital, non-WIRES-X users can still join in the conversations if the repeater is connected to a room. The repeater ID announces the room to which it is connected. WIRES-X users can change the room through the system’s directory, Enjoy! The Max Trac APRS transmitter is down for the count. Until a replacement of like kind can be secured, the D700 has been plugged in to keep the IGate and digi running. 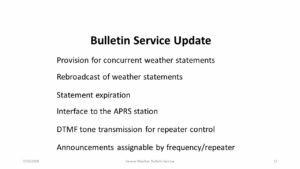 An update to the bulletin service has been installed, enhancing the weather statement handling capability of the repeater “controller” (see Blog entry for July 29 below). A video has bee made to demonstrate and is available at this link. One of the added features allows an APRS station to query the weather station for severe weather statements by sending an APRS message to N0AGX-11 in the following format: ?WX The station responds by sending an APRS message identifying the number of weather statements currently active, listed by time and date of issuance and expiry. Simultaneously the statement(s) is read over the Hibbing Repeater. The statement is directed to the station making the inquiry. A bulletin service has been added using the base station in the shack as a repeater “controller”. The controller consists of a custom written Visual basic program using the computer’s sound card and radio interface. 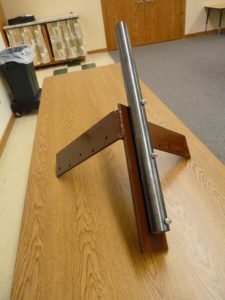 This allows time and temperature along with station weather announcements to be made. Pre-recorded public service such as meeting announcements and email weather alerts converted from text to speech can also be broadcast. A demo is available by clicking on this link. 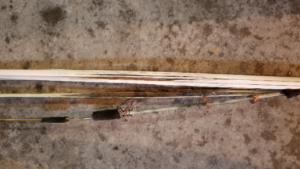 The repeater was shut down due to the failure of the Workman Collinear antenna. The two fiberglass tuning sections ruptured to what looked like an electrical discharge – probably lightning. A new Hustler Collinear was put in its place the following week. Tone added to RX&TX to squelch out the digital signal for analog users. This in affect silences the hash normally heard by the un-squelched receiver when the repeater is being used by a digital user. The repeater has been placed into operation at its new location within the hospital. The new location provides environmental control, emergency power, and a secure site. The DR2-X upgrade from the DR1-X repeater came just in time to move into its new home. The new repeater provides a more robust duty cycle, a courteous voice ID (the previous one over rode the user), a messaging feature, and a dual receive channel to provide remote control of the machine. The DR2-X repeater upgrade was received, configured and is undergoing bench testing. Tentative install date is set for December 19 at UCMC. The dual receive feature of the new repeater may allow remote monitoring with the addition of a separate receive antenna if the desense isn’t too much of a problem. This will permit linking two sites together. That second run of coax may be put to use after all! The repeater has been temporarily located at my QTH utilizing a J-Pole at 30 feet. The antenna has been installed. 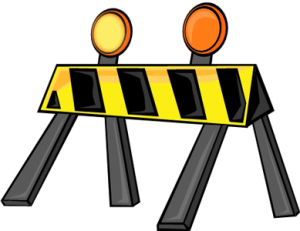 Issues with rack space allocation for the equipment is now being resolved. The limited floor space within the equipment room has precluded a separate rack as originally conceived. The repeater has been shut down to allow for equipment relocation efforts to proceed. The equipment will be relocated to an indoor equipment cabinet requiring rearrangement of components and cabling to be rerouted. Preparations for the relocation continue with the acquisition of the new Workman Model UVS-300 dual band base antenna. The fabrication of the roof mount has also been completed. However, the move has been delayed pending UMCM budget approval for the paging system. The Public Utilities has asked for a Salvage Schedule to document the actions to be taken in salvaging the radio equipment installed on the water tower. Review of the drone footage (see below) has revealed that some of the elements of both antennas are missing. So… is it worth the effort to rescue the radio tower – that is the question. 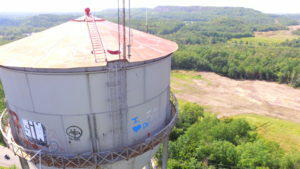 In anticipation of the relocation which includes demolition of the water tower, drone footage was shot to inspect the access and installation/deinstall of the antennas. Click on this link to be redirected to the YouTube Drone Footage. 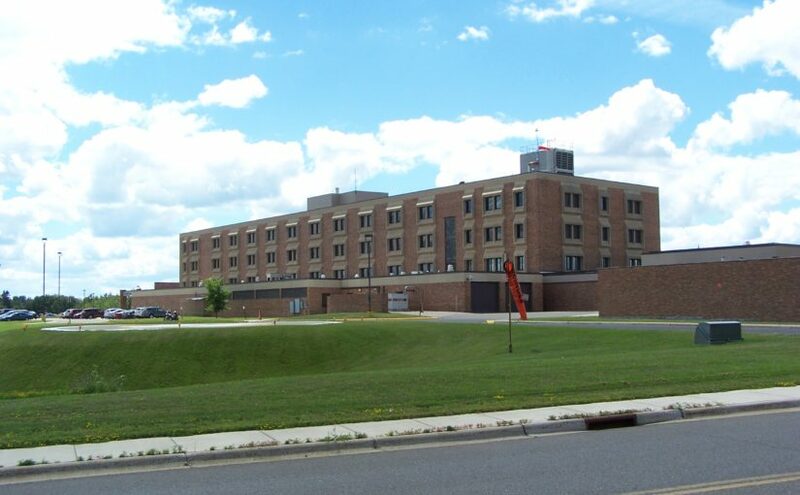 Plans are progressing to relocate the repeater to Fairview University Medical Center-Mesabi (UMCM). 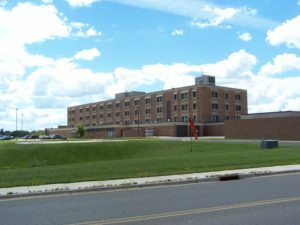 The hospital’s interest in emergency preparedness cleared the way to place the equipment into one of their mechanical rooms with access to backup power, internet and a raceway to the roof for the antenna run. The placement of the antenna will be on the roof of the elevator penthouse seen toward the center of the roof line in the picture above. October – November appear to be looking like the move in date.